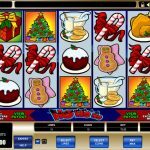 With Ho Ho Ho, Microgaming allows us to celebrate Christmas all year round. We have to say that Santa Claus theme is one of our favorite of all. It represents a festive season when we give and receive gifts. The game can be very rewarding too, instead of wrapping the gifts for you, they come more in a cash prize form. All the symbols are Christmas related and they take up the whole space on the reels so there is no background design to it. There are 2 special symbols in Ho Ho Ho each having a different function. Santa Claus is wild and it substitutes for every other symbol in this game except for the scatter. The only down side here is that the wild does not come with a multiplier, it only completes winning lines. The present with the yellow ribbon is the scatter symbol and it activates the main feature. All you need to do is to land 3, 4 or 5 scatter symbols to receive 20 free spins. All the wins during the feature are doubled so that is one really good present we might say. Great news here is that the free spins can be retriggered. So you can receive 20 more free spins. 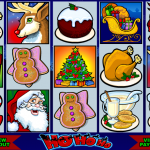 Ho Ho Ho is a very entertaining game and Microgaming is the name that stands behind this slot. This is an ideal game for punters who like slots with festive themes. 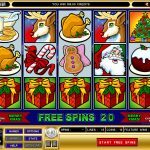 Although, this game lacks all the small features that other Christmassy slots have, but we cannot complain especially when we have a game that offers doubled wins during the free spins. Ho Ho Ho is a game that is definitely worth the try. If you’re also fascinated by the restaurant business then consider playing Harveys a 5 reel slot by MicroGaming.